DENVER – November 3, 2014 – Fathom Events and Open Road Films are partnering to present the exclusive “Rosewater: Jon Stewart & Stephen Colbert LIVE” event, including the feature film Rosewater followed by a Live Q&A with Jon Stewart, the film’s screen writer, director and producer, interviewed by Stephen Colbert, host and executive producer of the Emmy and Peabody Award Winning series “The Colbert Report,” broadcast from New York City. Fans can join the conversation by Tweeting questions now via Twitter using the hashtag #RosewaterLive. This special event will be showcased in select cinemas nationwide for only one night on November 13 live at 7:30 p.m. ET and tape delayed to 7:30 p.m. local time in all other time zones. Rosewater is based on The New York Times best-selling memoir “Then They Came for Me: A Family’s Story of Love, Captivity, and Survival,” written by the BBC journalist Maziar Bahari, which is now available in paperback and titled after the upcoming movie. 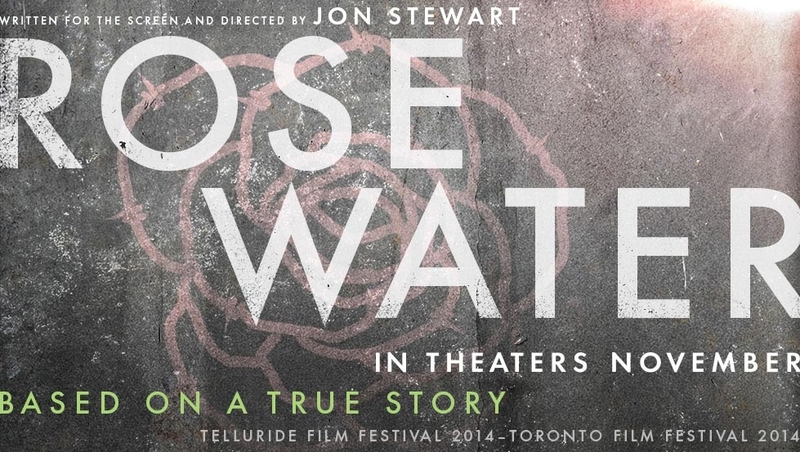 Following the exclusive Fathom Events preview on November 13, Rosewater will be in theaters nationwide on November 14. Tickets for “Rosewater: Jon Stewart & Stephen Colbert LIVE” are available at participating theater box offices and online at www.FathomEvents.com. The event will be presented in more than 300 select movie theaters nationwide through Fathom’s Digital Broadcast Network. For a complete list of theater locations and prices, visit the Fathom Events website (theaters and participants are subject to change). A true story, Rosewater marks the screenwriting and directorial debut of “The Daily Show” host and executive producer Jon Stewart, and stars Gael García Bernal, leading an international cast. Rosewater is produced by Scott Rudin, Stewart and Gigi Pritzker, with Lila Yacoub, Eli Bush and Chris McShane serving as executive producers. Rosewater has a direct connection to Stewart, who since taking over as host of Comedy Central’s “The Daily Show” in 1999, has turned the nightly half-hour satirical look at newsmakers and news-coverers into not only a perennial Emmy-winning juggernaut, but also an important touchstone on the zeitgeist. Stewart and “The Daily Show” covered Bahari’s saga nightly and the journalist appeared on the show to talk about his ordeal once he was released from prison. Rosewater follows the Tehran-born Bahari, a 42-year-old broadcast journalist with Canadian citizenship living in London. In June 2009, Bahari returned to Iran to interview Mir-Hossein Mousavi, who was the prime challenger to controversial incumbent president Mahmoud Ahmadinejad. As Moussavi’s supporters rose up to protest Ahmadinejad’s victory declaration hours before the polls closed on election day, Bahari endured great personal risk by submitting camera footage of the unfolding street riots to the BBC. Bahari was soon arrested by Revolutionary Guard police, led by a man identifying himself only as “Rosewater,” who proceeded to torture and interrogate the journalist over the next 118 days. In October 2009, with Bahari’s wife leading an international campaign from London to have her husband freed, and Western media outlets including “The Daily Show with Jon Stewart” continuing to keep the story alive, Iranian authorities released Bahari on $300,000 bail and the promise he would act as a spy for the government. View the event trailer on our YouTube page and visit our press site for event photos. Special Features: “The Nut Job” already Lands Sequel! LOS ANGELES, CA, January 23, 2014 – Open Road Films, Redrover Co., Ltd., ToonBox Entertainment Ltd., and Gulfstream Pictures are pleased to announce that THE NUT JOB 2, a sequel to the hit film THE NUT JOB – which opened on January 17, 2014, taking in over $25,700,00 at the holiday weekend box-office as the biggest independent animated film opening of all time – will hit theaters January 15, 2016. The announcement was made today by Tom Ortenberg, CEO of Open Road Films and Hoe-jin Ha, CEO and President of Redrover Co., Ltd. In animated 3D, THE NUT JOB is an action-packed comedy that follows Surly (voiced by Will Arnett), a mischievous squirrel, who must plan a heist to get into his town’s biggest nut shop in order to help his pals in the park gather food to survive the winter. Together with his sidekick, Buddy, Surly assembles a ragtag crew to help him get inside – and takes them on a fun-filled adventure that they’ll never forget. In addition to Will Arnett as Surly, THE NUT JOB also features the voices of Brendan Fraser, Liam Neeson, Katherine Heigl, Maya Rudolph, Stephen Lang, Jeff Dunham, Gabriel Iglesias and Sarah Gadon. Directed by Peter Lepeniotis from a screenplay by Lorne Cameron and Lepeniotis, the hit film THE NUT JOB was produced by Wookyung Jung and Graham Moloy. Executive producers are Daniel Woo, Hong Kim, and Jay Ahn as well as Bill Bindley and Mike Karz of Gulfstream Pictures. THE NUT JOB was a collaboration of Redrover Co., Ltd., ToonBox Entertainment Ltd. and Gulfstream Pictures. The deal was negotiated on behalf of Open Road Films by Ortenberg, Elliott Kleinberg, COO and Peter Lawson, Executive Vice President of Production and Acquisitions. Susan Williams and Stephen Zager of Loeb and Loeb negotiated on behalf of Redrover Co., Ltd., ToonBox Entertainment Ltd., and Gulfstream Pictures.